During February and March 2013, the Museu da Casa Brasileira (Museum of The Brazilian House), in São Paulo, hosted the exposition “Giugiaro: 45 years of italian design”, to celebrate the occasion of the 45th anniversary of Giorgetto Giugiaro’s worldwide famous design studio, Italdesign. Giugiaro is best knows as THE automotive designer of the 20th century, one of a kind designer, responsible for many iconic vehicles of the last decades, such as the Volkswagen Golf, the Fiat Uno and Panda, the current models of the Mini Cooper and the DMC DeLorean, best known for its performances in the trilogy Back to The Future. Along with his son, Fabrizio Giugiaro, Italdesign currently develops well succeeded projects in diverse fields of design, since cameras for Nikon, to Football Stadiums to Juventus. The home for the exposition in Brazil couldn’t be more adequate, the Museu da Casa Brasileira is the main brazilian design museum, also responsible for one of country’s most important design award contests. Since the core of the exposition is to celebrate the italian design, the local Istituto Europeo di Design could not be apart of this happening, beyond the sponsorship, IED São Paulo and Fabrizio Giugiaro proposed a challenge for the local Transportation Design students, a chance to freshmen talents to improve and show their skills on the business. The five best would have their concepts exposed on the exposition and the best one wins a unique chance to have a two week trainee season on Italdesign. 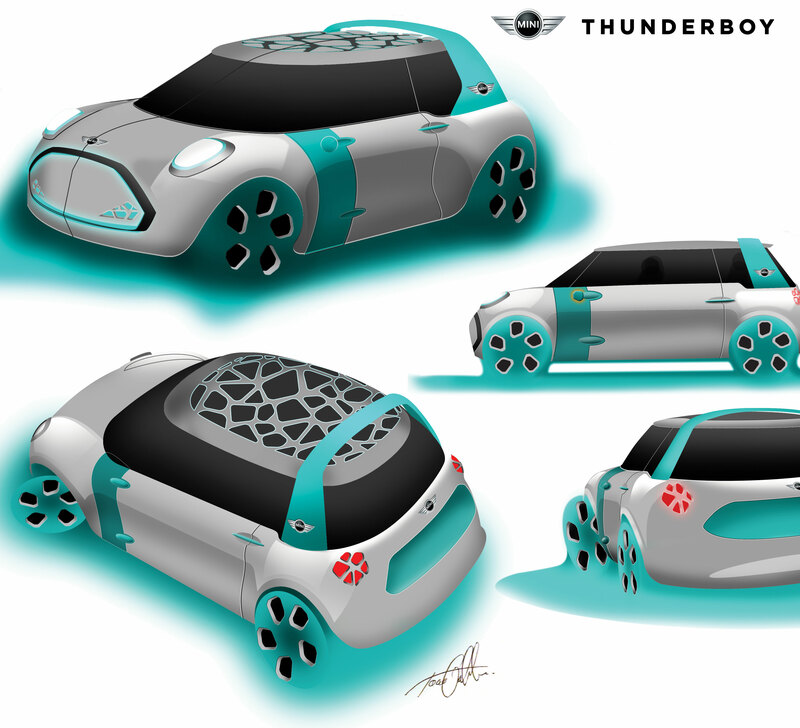 The challenge was simple, to create a compact sized car for the emergent countries (Brazil, China, Russia and India), sophisticated and eco-friendly, a category C car, with the space of a category A car, this means students had to design a Fiat Panda sized car with the internal space and leg room of a Volkswagen Golf. The only technical requirement given by Giugiaro was the vehicle package. A vehicle package is how most of the car designs starts, it is an engineering schematic drawing, which details the position and size of key components of the car such as engine, gearbox, wheels and suspension, passengers seating position and maximum height. Every car design has a reason to be, and generally it is based on the position of these components. Without it, the design is not consistent to production. A fact that have not been mentioned yet, I am a transportation design student in the Istituto Europeo di Design and I have participated on the contest, also fortunate enough to be awarded with fourth place, have my work exposed in the gallery and to shake hands of Giorgetto and Fabrizio Giugiaro. How did it worked? It is very common to “false start” automotive design projects spending paper and filling walls with dozens of conceptual sketches, this is a two edged knife, a wall of automotive sketches have no value if the proposal and the problem have not been understood. With that in mind, I established that the project proposals (roominess, size and sophistication) should be investigated and detailed. So, two mindmaps and four Pinterest boards later I had a solid idea of which strategy to follow, it should be sophisticated in one hand but youthful and vibrant in the other. First step: to define a brand. Having sophistication as the core requirement for design, I started to look for a brand for my car in the place where sophistication runs on peoples vains: Britain. British cars are known for their tradition, sportive pedigree and sophistication, they are powerful and beautiful yet charming and polite, an Aston Martin, for example, is a sportive car with a completely different pedigree of a Ferrari, loud and extravagant as an italian casanova. Aston Martin, Jaguar and Bentley: The sophistication and charm is the trademark of the british automotive design. Aiming at a compact sized car with a young and charming character I found no better brand than MINI, a very efficient car maker in therms of making people smile to their main product, the Mini Cooper. Fun, youthful but still charming and sophisticated, MINI is eclectic, it can deal with 50 year old gentlemen wearing tweed suits and trousers as well as 23 year old girls wearing flower dresses and huge sunglasses. Two conceptual lines inspired me in this project. First, the vibrant, electric and never-sleeping life of the emergent cities such as São Paulo and Mexico City, how vibrant the life is, particularly at night, when people and the city goes through a metamorphosis, the neon and the LEDs glow brighter, the life looks to a manner to keep awaken while the city will as well not sleep. There is this necessity to be seen and to transform the space. Street art, graffiti, light graffiti, dubstep music, neon glowing bikes and LEDs were main inspiration here. Second, the mind-blowing constructions of iraqian architect Zaha Hadid. The shape, the highlights, the harmony, the rhythm, everything is different in Hadid’s buildings, the visual effect is outstanding. While looking for different structures and shapes for a vehicle, her work came as good reference in which to mirror. Conceptual mood board of references and project sketches based on it. 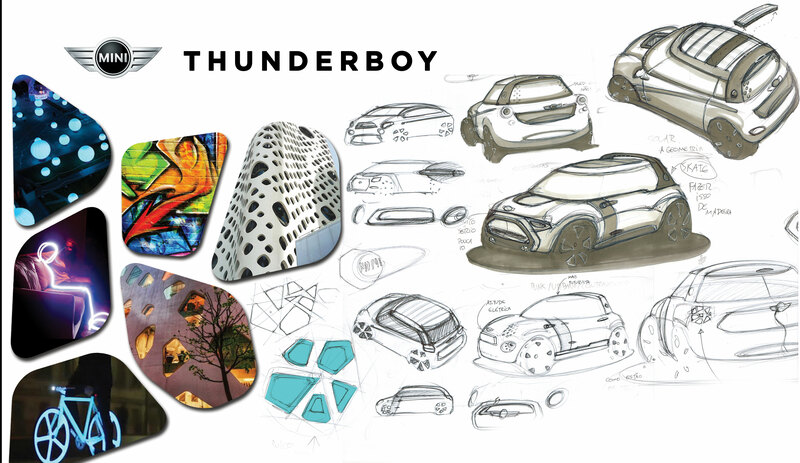 Thunderboy is a four-seater electric vehicle designed for the young citizens of the 21st century emergent cities. The name stands after MINI’s tradition to name their vehicles after male figures, such as Clubman, Rocketman, Paceman and John Cooper, but this one is not a man, he is an electric and hyperactive boy, instead. Eye catching, its design is an audacious breakthrough which mixes the electricity of the urban lifestyle and the passion of the young personality to the sophistication of MINI. Its contemporary architectural shapes allied to the green LED light systems transmit the image of a car that wants to be seen, which purpose is to enlighten the nightlife and to be as vibrant and impacting as the urban jungle, to be the wild and purposeful extension of a vibrant youth. Its one-engine-per-wheel electric system is powered by a battery of Graphene, an organic carbon derivated compound capable of quicker charging and more efficient energy accumulation than regular batteries, it is also biodegradable, so at the end of the battery lifespan, it can be buried and transformed into organic matter. The electric package allows Thunderboy not only to be more sustainable, but to provide more roominess, once regular components such as engine and petrol tank have disappeared. 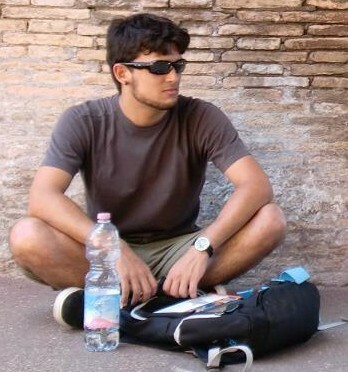 Profession: Transportation Design Master Student at IED São Paulo, Industrial and Innovation designer at Insitum Brasil, instagram Beetle photo collector. I do not even know how I stopped up here, but I believed this post was great. I do not realize who you’re but definitely you’re going to a well-known blogger when you aren’t already. Cheers! This entry was posted on April 26, 2013 by Carol Beatriz in Guests and tagged automotive, award winning, brazilian design, creative process, Design, eletric car, Giugiaro, istituto europeo di design, Italdesign, New Products, Product design, transportation.